Fra Giovanni di Capistrano preaches while a nicely uniformed Italian infantryman with a very Manciolino-like partisan and rotella dispatches a fallen Turk. 15th century. Note the ship in the background. 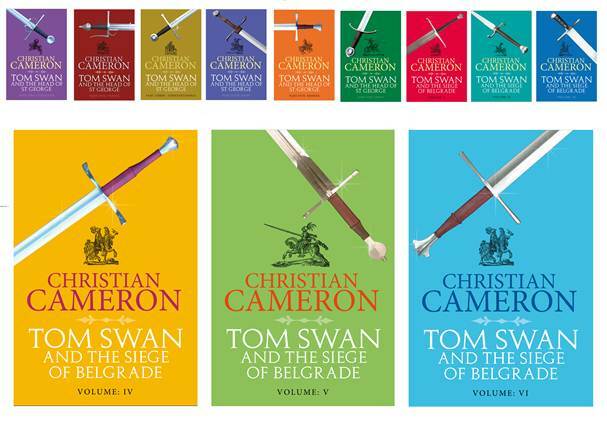 This week, I’m writing the last pages of the last installment do ‘Tom Swan and the Siege of Belgrade.’ It is, I think, some of my best writing; by including a major female character who is, to put it nicely, a ‘woman of the army,’ I’ve taken an opportunity to give a voice to the life of common women in the period; and as usual with Tom, there’s some good history, some fun, and some fighting. In this case, a foray into boat-building, too. But the pivotal moments of the siege are still, at this 11th hour of writing, giving me serious trouble. 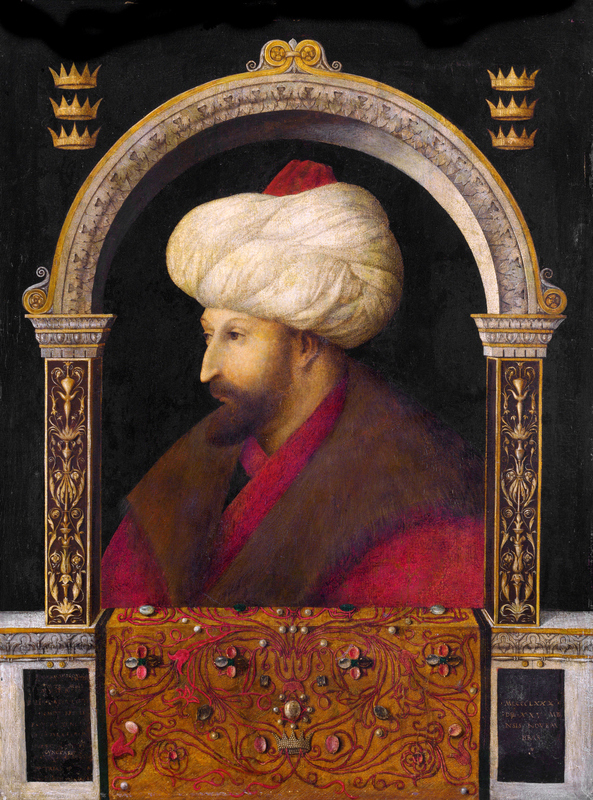 Bellini’s portrait of Mehmet II. One of the best things about writing this period is the quality of contemporary images. In mid July of 1456, Sultan Mehmet II and a great army of the Ottoman empire laid siege to the Fortress and city of Belgrade, in what was then Hungary (even saying that is a simplification). By late July, his siege had failed and he’d been defeated in a great battle–probably the most significant military defeat of Mehmet’s reign, and the first glimmer of hope in the West after the fall of Constantinople to the Turks. So… that’s about as much as can be said, in terms of pure fact. 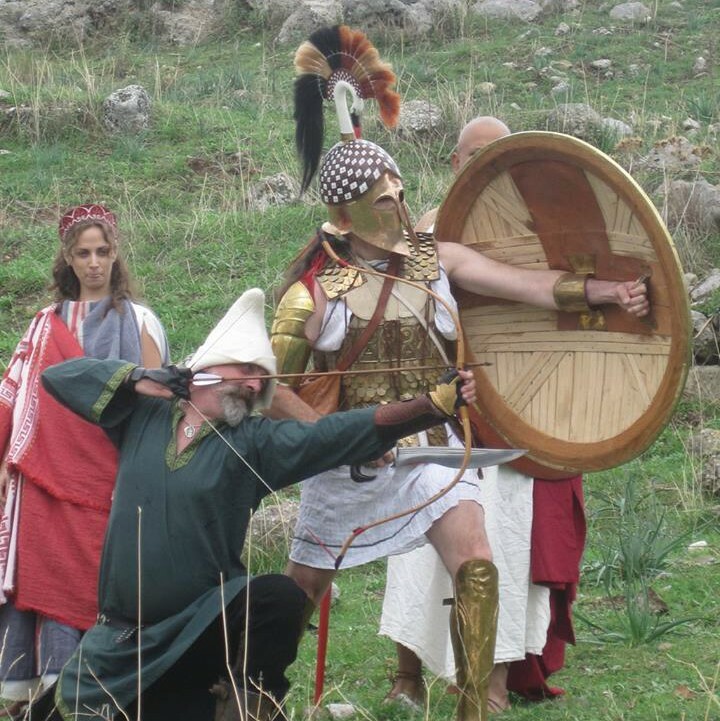 Today’s blog is an exploration–for historical fiction readers and writers–of the boundaries between history and fiction, and of the sources and perils of research. Let’s just begin with a timeline of the siege. Without opening a book (using internet sources) you can find at least four timelines for the siege. Most of them share some commonality; all agree that the Sultan first arrived with his advance guard–which may or may not have fought an action with Janos Hunyadi (the Hungarian ‘great captain’ and last best hope of ‘Christendom’ at least according to some) to the east of the city. Later, Mehmet II set up his guns and began the bombardment. His navy–a river navy–came up the Danube at some point, and joined the siege. Then Hunyadi’s navy scored a ‘miraculous victory,’ breaking the Ottoman’s chain (was that a physical chain like the Knights of Saint John used at Malta? Or merely a metaphorical chain of ships?). Later still–probably around the 20th of July–Mehmet ordered a general assault, which seemed to succeed and then was bloodily repulsed. Finally, a day–or two–later, the Hungarians counter-attacked. They may have been led by the bloody-minded Dominican Giovanni da Capistrano. Or not. He may in fact have been the actual commander of the ‘Crusaders.’ Or perhaps a figurehead. Or perhaps, he played almost no role at all. That’s another story. But likewise, it has been very tempting for generations of Hungarian and Serbian historians to mythologize Hunyadi and his efforts. And, in wanting to claim the victory for a nationalist agenda and deny any role to the German crusaders and Capistrano, eastern European historians may also have been culpable. Communism emphasized the role of the peasant crusaders–a people’s war. And so on. Once you leave the internet for scholarly sources, the situation only grows in complexity., The failure of the King of Hungary and the Emperor to provide any meaningful support to the crusade turns out to be understandable in modern terms–Hunyadi, it appears, was a typical Renaissance warlord/tyrant, and a major victory by him would, it was thought, undermine the stability of the Hungarian crown and perhaps even of the Empire itself. Both the King of Hungary and the Emperor preferred to have the Ottomans as neighbors than Hunyadi as warlord. Again, it is easy to paint Hunyadi as either the villain of the piece or the hero. And lest we think the Emperor and King to be fools–in the immediate aftermath of the glorious victory, Hunyadi died–and his son Mattias ended, after the dust settled, as King of Hungary. See? And once you begin to examine the role of Vlad Tepes, the original Dracula–all hope of dispassion goes flying out the window, and the reader/researcher/writer is locked in a struggle between myth and prejudice. I’ll leave Vlad for another day. Instead, I’ll resolve the lens of research down to a few issues–again, I hope to entertain and maybe help the reader on how this process works–for the writer. I decided to emphasize the naval battle. First, my main character has considerable experience at ‘sea’ and second, as a London-born man, he understand river boats and cargoes. I confess that as a former Navy man, I like sea fights. 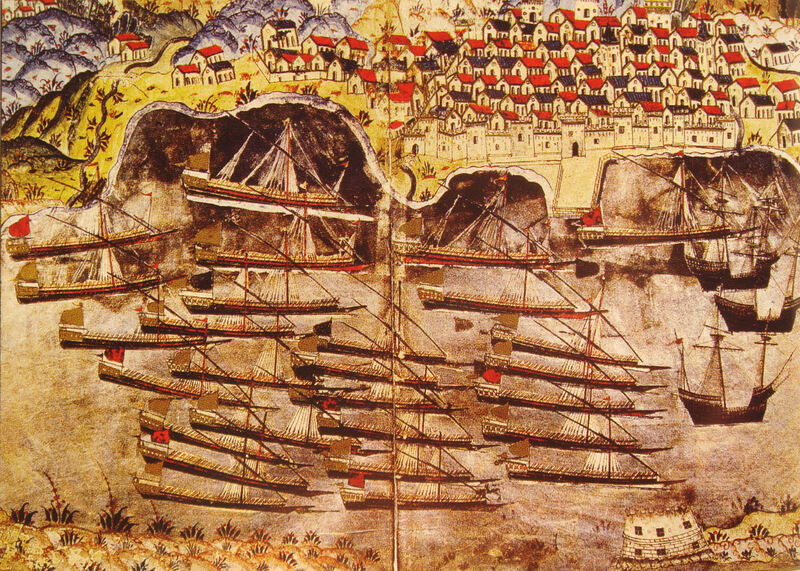 This is actually Barbarossa’s Ottoman fleet off Toulon in 1543, almost 100 years after the siege–but the ocean going galleys were probably the kind used at Belgrade, brought up river from the Black Sea. My riverine ship fight began to fray at the edges. The issue is not just one of chronology, but of tactics. Setton’s work makes clear that Hunyadi had moved his ‘banderium’ or private army to the shores of the Danube probably directly across from the fortress, by the 4th of July or thereabouts, while the crusaders rallied at Slankamen or nearby, about 40 kilometers north of Belgrade on the Danube, building and/or collecting a fleet of river boats and barges. If the Ottoman fleet actually barred the Danube near the mouth of the Sava River, then their northern flank should have rested on the far bank–two contemporary accounts insist that the Ottoman galleys were chained together. With Setton’s chronology, it would appear that the Christians held the northern bank of the Danube from 4 July–in other words, the whole time the Ottoman fleet was in the river. Why didn’t the crusaders simply bombard the Ottomans from the banks? Or did the Ottoman army have a fort–and earthwork–built on the far bank, as Prince Eugene did in 1717? I am not suggesting that it was in the same location–this map of the 1717 siege shows the Austrians laying siege to the Turks, and a Turkish relief force would have to come up the Danube, not down. But if you look at the four ships in the upper right corner, you’ll see that a small fortress covers the chained Hapsburg galleys. Moving this sort of construction to the island at the mouth of the Sava opposite the fortress would explain how the Turks defended their line of ships, and kept Hunyadi’s gunners from winning the ‘naval battle’ from land batteries. I chose to go with this–based on my own analysis of the evidence. A last tidbit. I don’t read Hungarian or Romanian, and it is entirely possible to me that there are excellent accounts in these languages of the siege. On the other hand, Setton, who was the kind of thorough scholar I most admire, seems to have examined every source in Latin… and Latin was the official language of Hungary and the Empire. 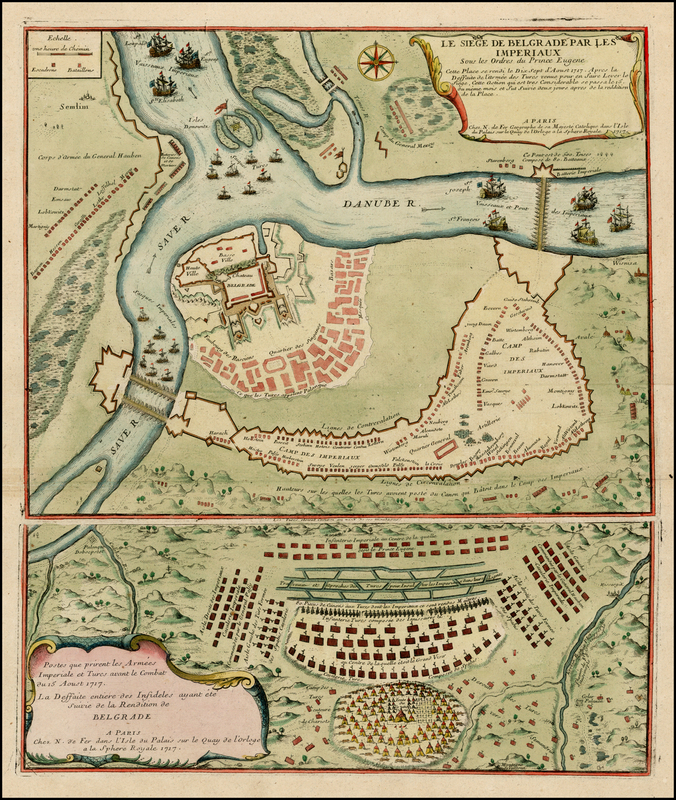 The remarkable map of the 1717 siege–a map which I found remarkably enlightening in almost every detail–came from the inherent, and was never mentioned in any of my sources, scholarly, military, or other. I found it because Prince Eugene was one of my childhood heroes, and I remembered that he, too, had laid siege to Belgrade. Without the combination of the two–Setton’s painstaking work, and the fortuitous discovery of the map, I would not have had as good a scene. Anyway–that’s the research process, for a fight scene that fills a few pages, in an immensely complex conflict. And let me add (as we live in a culturally, if not religiously, charged atmosphere vis-a-vis ISIS et al) that my use of ‘Christians’ and ‘Crusaders’ and ‘Ottomans’ is purely for the sake of simplicity of understanding. Mehmet II was a modern monarch of a powerful nation-state; most of the gunners serving his superb artillery were Hungarian, Italian, and other ‘Christians.’ Many of the Balkan auxiliaries of the Sultan were–or had been–Christian. Among the Crusaders, Capistrano made a name for himself before the siege persecuting Jews and homosexuals and proto-protestant ‘heretics’–a thoroughly unpleasant man, an inquisitor very much in the mold of a Warhammer 40K novel. Most of the ‘crusaders’ appear to have been outraged peasants who couldn’t believe that their ‘lords’ couldn’t be bothered to show up in armour and save them. Most of the fighting, on the other hand, may have been done by Hunyadi’s hardened and un-penitent professional soldiers, themselves mainly Wallachians and in some cases Italian mercenaries..
History is almost never simple, and their really aren’t that many good guys. Wow, great Map! 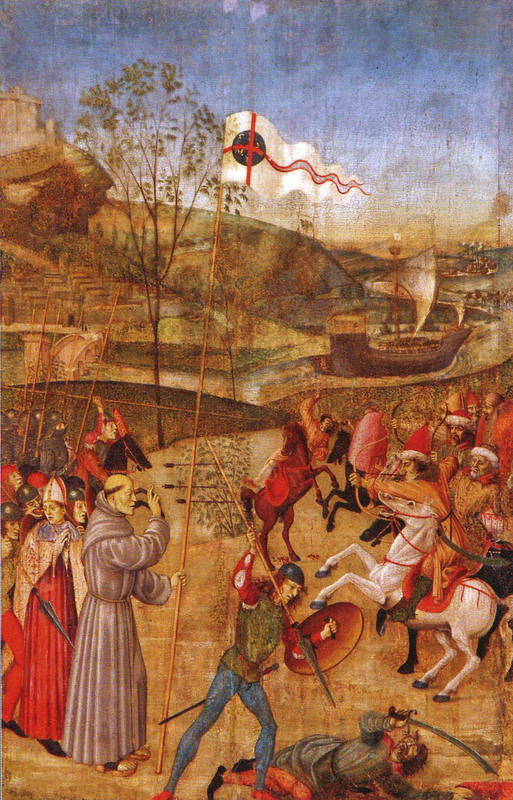 Where & when is the Fra Giovanni di Capistrano painting from? I love how educational your books are. Thank you! Hi Christian! I am a lover of history and a Romanian. Too lazy to do any research myself, but if you come across a Romanian text you’d need translating, I’s be happy to help! It’s so on! Before you start researching though, you should know that the first ever document written in Romanian did not came about until 1521, so any Romanian first hand accounts would be written in Slavic characters. Hungarian sources for the period are usually much richer, but as far as I know the oldest description of the battle dates from about 12 years after. So yeah, if you find the source, I’m happy to do the translating.